Firmly anchored in terroir and tradition, it was in the order of things that the Tour d’Argent opens its bakery one day. The baker of the Tour, Alexis Bourgeot took up residence in this new store facing the Tour; 2, rue du Cardinal Lemoine. The 26 year old Alexis always wanted to become a baker. 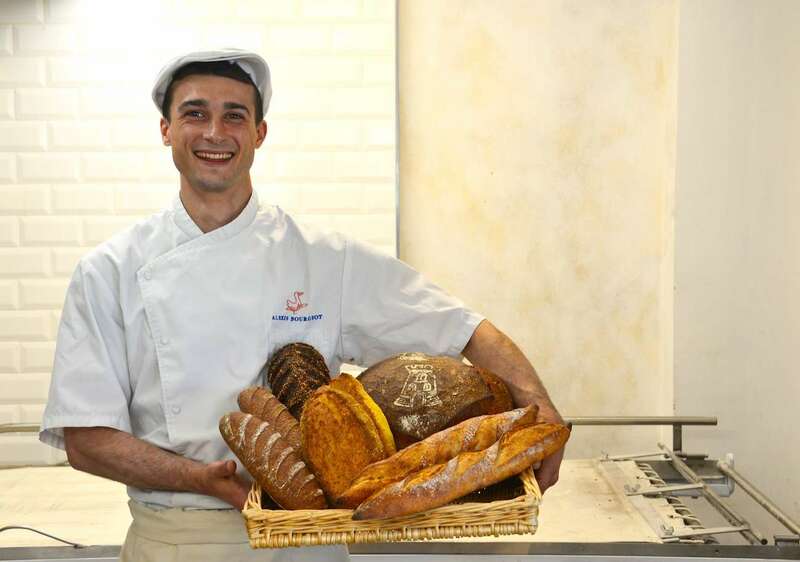 Having done a stint in the Pâtisserie of Cyril Lignac and the bakery of the Invalides of Philippe-Marc Jocteur, Alexis has a taste for good quality work, respects the product, is skilled and seeks the complete satisfaction of his customers. In a beautiful setting of light marble and solid wood with an open space which gives on to the production unit of the bakery, the freshly baked breads just out of the oven look majestic: baguette, pies made from freshly ground flour, Scandinavian breads, whole wheat breads, corn flour breads, Punchy breads and many more. In the showcases, “viennoiseries” in pure butter, the Tour d’Argent chocolate eclairs, coffee eclairs, lemon, chocolate or even seasonal fruits tarts whet the appetite. The spongy madeleines with hazelnuts and other travel cakes also remind you of your childhood which does not seem so distant. Where is the star of the house? Here it is: perched at a height, the “baguette of the Tour” seems to watch everything closely. Sold at the round figure of 1,20 €, it is – like all our breads, Viennoiseries, cakes and tarts – made in our bakery in front of you, with slowly fermented natural leaven, using flour from the mills of Chars and Brasseuil and kneaded by hand! … a marvel of know-how.